A welco me email to new subscribers should be a vital part of your email marketing strategy and a powerful way to build relationships with your customers. It also sets the tone at the moment when someone shows they’re interested in your business. Surprisingly, not a lot of businesses send welcome emails, with only 57.7% of companies do so. This article will show you the value of, and some ideas for, welcome emails. There are many incentives to send welcome emails. Obviously, people who subscribe to your emails clearly have interest in your business and want to hear what you have to say. They have a 50% open rate, making them 86% more effective than email newsletters. Welcome messages usually have 4x the open rate and 5x the click-through rate of other bulk mailings. With little effort, businesses can set up automated welcome emails. A welcome series helps you connect with your audience, capture interest, and set expectations for communication in the future.Retailers that send a series of welcome emails see a 13% increase in revenue compared to the original welcome email. For example, Maggie Whitley, owner of online shop Gussy Sews, lets Gussy fans know the value in signing up for her emails. And in addition to sharing regular news, She also sends a welcome email offering 15% off any online purchase. That single email sees a 79% open rate, a 21% click-through rate AND it drives online sales year-round. 1. Clever Coupons. Customers love coupons. Even a modest incentive can create substantial results. 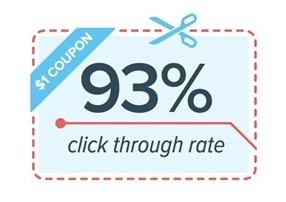 For example, Chinet sends a $1-off coupon in their welcome email, which boasts a 93% click-through rate. 2. Social Savvy. While making introductions, show your new subscribers how they can connect with your business online. Adding links to your social sites in a welcome series is a simple and effective way to integrate your email and social marketing. Give new subscribers the opportunity to explore your brand on their own and trust that they’ll probably do it. 3. Clean Confirmations. Adding a confirmation link to your email can helps form lasting relationships with your subscribers. People who receive a welcome email show 33% more long-term engagement with a brand. If you’re not sending a welcome email (or series), it’s time to start. Welcome emails perform better than other marketing emails, with 9x more transaction rates than other email types. Don’t miss out on the chance to build better relationships with subscribers. Sometimes, the key to marketing success starts with a simple hello.